The Moto G5 Plus has been through the rumor mill several times while the regular Moto G5 remained out of the spotlight. 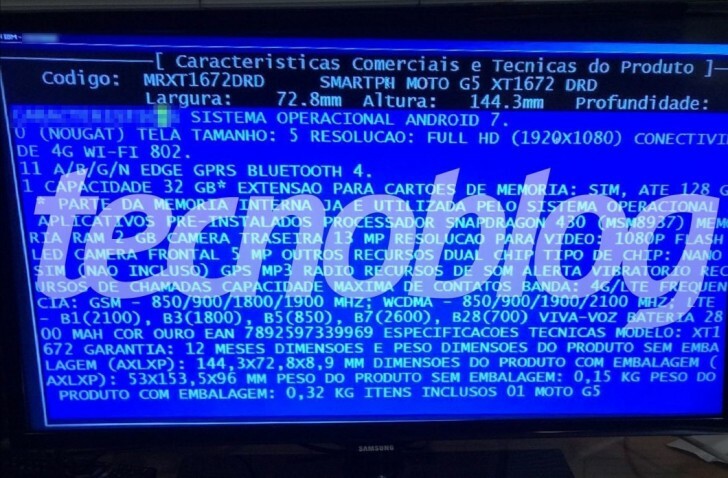 Until now - Brazilian blog TecnoBlog.net has gotten hold of the regional version (XT1672) and published the key specs. This phone is smaller with its 5” 1080p screen (vs. 5.5” 1080p for the Plus model). It will launch with Android 7.0 Nougat (of course) running on a Snapdragon 430 chipset with 2GB of RAM. That’s less impressive than the S625/4GB specs of the G5 Plus. The non-Plus model will still come with 32GB of storage, though, plus whatever you put into the microSD slot. Then there’s the camera - 13MP on the back, 5MP on the front - and connectivity (Wi-Fi a/g/b/n). The battery capacity is iffy - 2,800mAh - rather than the 3,000mAh reported by the FCC (this could be the difference between typical and minimal capacity). Unfortunately, there’s no info on when the Moto G5 may launch or how much it would cost. All we know is that it got the thumbs up from Anatel (the Brazilian equivalent of the FCC).